1The essential elements of Eight in Myanmar – Burmese astrology are listed below. Burmese zodiac animal signs are the invention of ancient, wise monks of Myanmar (formerly Burma). They created this astrological system through a keen understanding of the cosmic world and incorporated this knowledge with their observations of the skies and the animal kingdom. This ancient branch of astrology is called Mahabote (also depicted as: MaHaBote). The term Mahabote translates to mean “little vessel” or “little key,” probably because it is a smaller branch-off from the larger Hindu astrological system. Nevertheless, big things come in small packages and Mahabote is a valuable container or key to extremely powerful insight within the realm of esoteric knowledge. Myanmar astrology is based on the number eight. The energy of eight proposes cosmic balance and resonates at a frequency of divine equilibrium. It is said the number eight reflects harmony in energy: deflecting imbalance and ever perpetuating congruence. The essential elements of Eight in Myanmar – Burmese astrology are listed below. Appropriately, we see the eight in all manner of powerful symbols native to Burma – Myanmar and its surrounding regions. Most noteworthy is the sacred lotus blossom splaying out its eight voluptuous petals for our contemplation. In-line with the foundational Eight energy, we learn that the ancient Burmese astrological system is based on seven planets (seen in Hindu astrology), plus Rahu. Rahu is unique in that it is not a planet, but a conceptual celestial presence. Literally defined, Rahu is the point of intersection between the earth, sun, and moon at the time of the eclipse. For astrological purposes, Rahu serves as an invisible planet of the Burmese zodiac system. This makes eight planetary entities that dance into our own orbit and thus makes their mark on our lives as we move through time. Recommended: What is Your Lucky Zodiac Sign Animal? Mahabote is also based on the eight days of the week. To accommodate for the extra day, the ancient Myanmar monks split Wednesday in half making two days: Wednesday morning (12:01 am to 12:00 p.m.) and Wednesday afternoon (12:01 p.m. to 12:00 a.m.). The image shows correspondences of animal signs with days of week cardinal directions and zodiac symbol. Another aspect of this form of astrology incorporates the cardinal directions. Here again, we see the utilization of the mystical power of the number eight, as there are eight cardinal directions. Each direction vibrates in its own distinct symbolic energy. According to your day of birth, your direction should prove beneficial for you. To determine your zodiac animal signs, (like your Western astrological sun sign) all you need is the day of the week you were born. Below, I’ve provided the basic personality traits for your zodiac animal signs according to Mahabote. Horoscopes and charts are determined by following an intricate (and fascinating) process of chart-drafting which involves consulting a myriad of influences such as planets, stars, houses, times, gems, deities, geographic locations, elements, polarities, classifications, anatomy – the list of variables are pretty impressive. Zodiac animal signs are just the surface layer of Mahabote. A deeper study is encouraged to get the vast depth of this amazing astrological art form. Do some research on your own and you will discover some incredible insights into yourself and the world in which you live. Further, the more you learn of the “little key” more astounding doors of esoteric knowledge will be open for you. 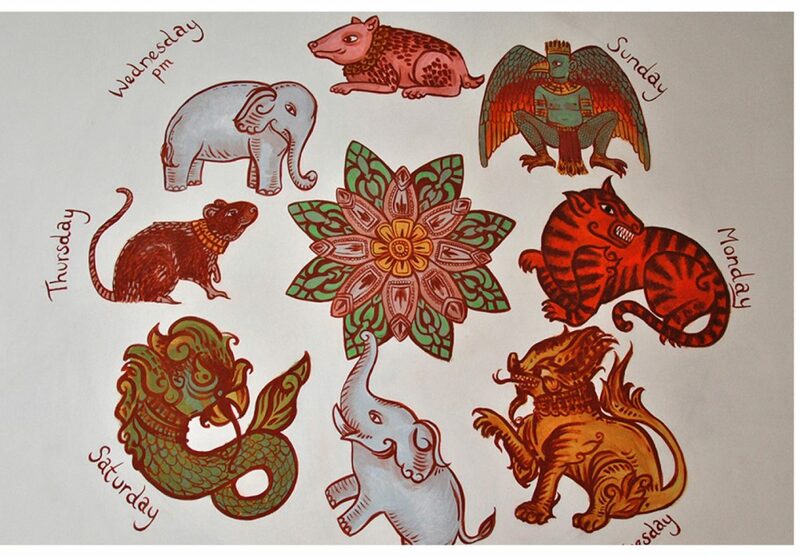 In the meantime, enjoy this (somewhat over) simplified version of this intricate and colorful form of astrology: The Myanmar – Burmese zodiac animal signs. You are kind and generous. You would give the shirt off your back to someone in need. Some think you are overly gracious. You love a challenge. The tougher the obstacle the more motivated you are to crash through the barrier to reach your goal. You are energetic, and rarely allow life to get you down. You naturally motivate others and are an inspiration to many. You are very intelligent and intuitive. You have a keen eye for detail. You are strong and patient, but only to a point. You detest being taken advantage of and you don’t like people wasting your time. You are goal oriented and like to succeed. You are respectful of laws and take responsibility for your actions. You are a crusader, a natural leader, and a noble person. You hold yourself with dignity and honor. You can be strong-willed and opinionated, but you are usually correct in your estimations. You make decisions easily and don’t like to compromise. You’ll take on any challenge, especially if you are supporting the underdog. You are unpredictable and enthusiastic. You have a taste for danger and action that sometimes gets you into trouble. You are spontaneous and people love you for your passion. You are independent and like to be in control of all situations. You can be hard to figure out because of your contradictory nature. You are a private person and do not like people meddling in your business. However, you are excellent at promoting yourself and your works. You like taking action, but only if it’s a sure thing (little risk involved). You are very successful (especially in business) and you are able to accomplish achievements on your own terms. You are clever, witty and intelligent. You have the ability to tap into resources and look at things from an opportunistic viewpoint. You can be introverted and quiet, but you are unstoppable when it comes to getting what you want. You are focused and driven (sometimes overly so) and have a knack for getting ahead. You are naturally artistic and creative. You have tons of fabulous ideas, but have a hard time seeing them through to completion. This may be because you are going in so many different directions at once. But you hesitate to pick one thing because you bore easily and get tired of the same thing. You are loving, kind and very sympathetic. You are very sensitive to others and make a wonderful friend. You are philosophical and understanding. People are naturally attracted to you because you have an easy confidence about you and you have a great sense of humor. You prefer to work alone because you believe you are the master of your own destiny and do not like depending on others to get the job done.